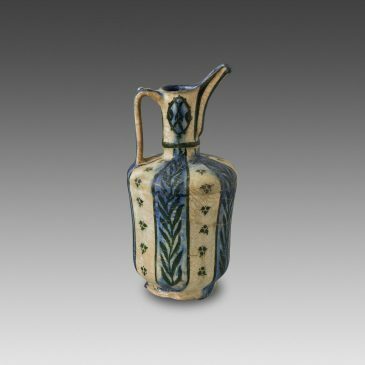 In the large production of Islamic pottery, ewers are an attested form, although rare and never really exploited by ceramists. 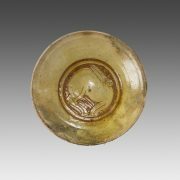 Datation : 13th century A.D. 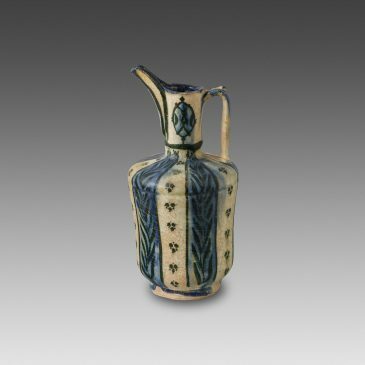 Turned in a pinkish terracotta, covered with a white slip and with dark green/black and blue paint, this example recalls the “albarello” (one of the most popular contemporary forms), by the profile of the cylindrical body mounted on a disc-shaped foot. In the upper part, however, it is provided with a long spouted neck and with a ribbed handle that highlight its elegance. The decoration is organized in vertical strips, painted alternately in blue and white. Plant motifs (small flowers and long stems with leaves) punctuate the decoration on the body, while two elliptical medallions adorn the sides of the neck. 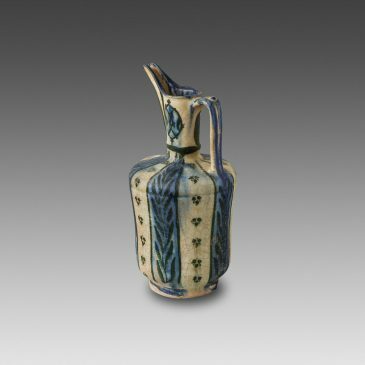 This ewer can be classified in the rather small group of white background ceramics with a transparent underglaze decoration but a matt finish, manufactured in Iran (probably in Kashan) during the first half of the 13th century A.D. 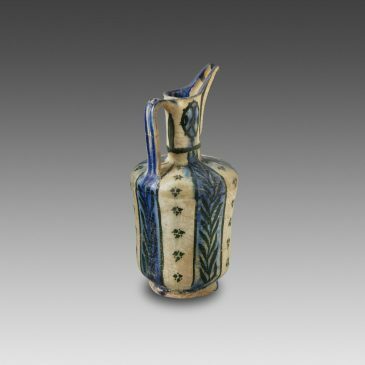 These vessels are characterized by a sober polychromy, based on the use of black and blue (an unstable color that does not enable to precisely delineate the motifs). The patterns, always stylized and linear, often come from the vegetal world; the sometimes abstract inscriptions are also part of this repertoire. Among the most common shapes, one should mention the wide cups without handles and the tankards with a single handle. Sometimes the glaze is turquoise blue. Complete and in excellent condition; the handle and the neck are cracked and maybe reglued. Glazed surface but matte-looking luster. 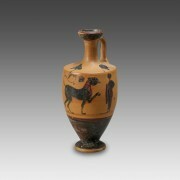 This amphora was made in the traditional Etruscan technique known as “black bucchero”. 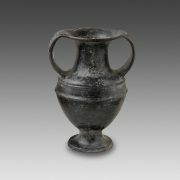 The vessel was first carefully polished in order to obtain the shiny, lustrous surface typical of this class of containers; it was then fired in an oxygen-poor kiln, which caused the fabric of the clay to change color from its natural red to blackish gray.